BoxBytes. They combine normal hits with the Gloom attacks of the Phantoms. Not a huge deal. Chillaxes. They like to attack normally. Flashy! Flans. Quite slow compared to most enemies, Flans are quite dangerous thanks to their high health and tendency to all attack at roughly the same time. They use Balloon attacks to smack your characters en masse, and can quickly wipe you out. Stay on top of your healing at all times. - The path splits near the entrance. Swing north and you can pass through several trees to get at a chest. The chest contains the Quickstart: Party Chip. - Wander west until you hit the edge of the screen. You may find some Token chests out here as you hit a split in the path. There’s a prominent lock to the south which you can’t bypass, so you’re kinda forced north. There’s another Lolbit’s Byte Store up here, this one selling Mini-Reapers, Reapers, and X-Reapers. From what I can tell these little guys have a chance of instantly killing enemies, though… not a very good one. - Fredbear’s waiting for you in the north. You may know what that means. Fredbear gabs. When you reach the screen with the 'Done' button, wait him out for a few seconds and he'll glitch out. He'll then tell you to enter Mysterious Mine, the next area to the north. Head north two intersections, until you hit a rock, then check on the left for the clock. Walk left to push the four cupcakes into their boxes. 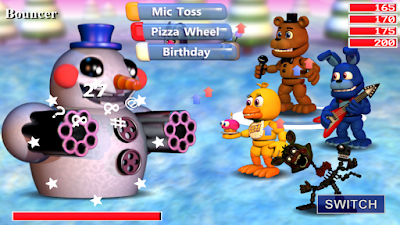 Once Fredbear’s gone, one way or another, you’ll find a frozen fiend waiting juuuuust to the north. 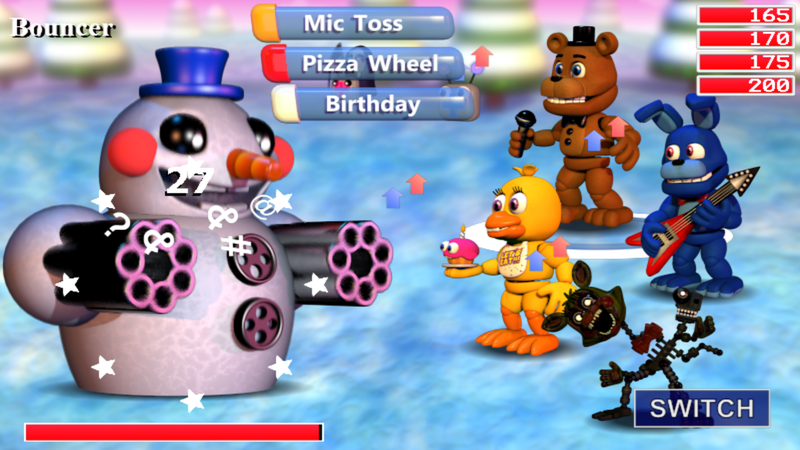 Bouncer, a boss in FNaF World. This dude’s a big step up from the Auto Chippers in terms of difficulty. Along with a normal attack that can do upwards of 150 damage to a single character, Bouncer has a Snowball attack that will thoroughly batter your whole party. Hold up on the healing even a little bit and you’re apt to lose a party member, and everything will go downhill from there. Equip Bytes that will attack Bouncer and heal yourself, then focus most of your efforts on buffing and restoring your party while the Bytes do most of the damage. Poison attacks from one of the Phantoms, such as Phantom Mangle, can go a long way to sapping Bouncer’s strength as well. - Are we going to Lilygear Lake yet? Heck no. There’s another entrance to the Mysterious Mine up here, and now you should be strong enough to brave the depths. In we go...? - NOPE. Not yet. Before entering the Mine, look to the weird, flexing Freddy and / or Foxy shadow on the log near the entrance. There's a rock to the right of this shadow that you glitch into by pressing up against the bottom. This will allow you to travel across the landscape at will and get at a red chest back east, on the outskirts of Fazbear Hills. The chest contains the Block: Unscrew Chip. Be warned, however! Like all glitch landscapes this one is filled with deadly enemies who can give even level 30 characters a run for their money, and you woooon't be that strong on your first visit. Touch the rock again to return to the 'normal' world. Thanks. I was having a hard time trying to find the dang Run:Luck chips to complete my collection. Peace. Fredbear didn;t glitch out, I think I broke the game. Don't worry! You didn't break the game. The same thing happened to me as well. After Fredbear covers what he needs to say, the small 'done' button appears. If you want the 'clock' ending, which I suppose you do, wait around half a minute to a minute. Sometimes it may take a small bit, but he will glitch out eventually! im stuck on fredbear glitching out thing should i restart? How do I get to the subtunnel? I see a flexing shadow subtunnel. But it is blocked! Its right north of the mine entrance. ITS BLOCKED!!! I'm on mac pls tell me where the dusting fields subtunnel is!!! I defeated the bouncer and I am next to the flexing shadow! Wow, The Subtunnel is the rock glitching in the right! I found it. Dude. THE ROCK NEXT TO THE SHADOW. Hold up against it. Is This For Pc Or Mobile Or Both ? I Tried To Hold Up/Swipe Up Against The Rock, ( Which Rock ? ) & It Didn't Work ! Which Rock Is It Anyways ??? ?